Growing up in Austria, there were two vegetables that were grown all around me, but that nobody seemed to eat: pumpkin and sweetcorn. My grandparents owned and worked a small farm, which was more a labour of love with my granddad combining the functions of cobbler, designated medicine-man and mayor of the little town my parents grew up in. But grow vegetables they did - and for sweetcorn and pumpkin he just had one thing to say: pumpkin was for the pigs and sweetcorn for the chicken. We never ate any of it ourselves. The only experiences of eating sweetcorn as a kid was going to a lake near my hometown in the summer and stealing baby sweetcorn from the field behind the parking lot. Eating it there and then, with an adequate portion of guilt gnawing on us while we were gnawing on the cob. And, well, there was popcorn on those long game nights our family used to cherish. Homemade, in the pot, with luscious amounts of butter, because my parents never owned a microwave. And because we love our butter. But that's a whole different story. So I only came to appreciate fresh sweetcorn when living in London and enjoying BBQs in our own garden. We always had corn on the cob there, with generous amounts of chilli and herb butter. And if there were leftovers, I would make sweetcorn soup or salad the next day. This recipe uses fresh sweetcorn, as we don't have a BBQ here - but feel free to substitute leftover grilled corn or even try canned if maize is not in season in your neck of the woods... just adjust the cooking time accordingly. And because no soup is complete without a topping, be it garlic croutons or a generous sprinkle of parmesan, I added some crunchy popcorn and crispy bacon... a match made in heaven. I made enough of the topping to be nibbling away on it for the rest of the evening - it's unbelievably moreish, don't say I didn't warn you! This recipe used very basic ingredients, most kitchens I know will have at least soy sauce at hand, apart from that only rice wine (could be substituted with Fino sherry or Noilly Prat at a push) and yellow bean paste is needed - the latter is easy to find in larger supermerkets, as the ready-made sauces are always the first ingredients to be introduced. When I cook Asian food, I like to use coconut oil - and I know that it's got a bad rep, but I believe that for most parts, this is a government agenda trying to promote US grown soy and canola over Asian produce. Coconut oil, if produced organically and sustainably, is actually a great option both for its health benefits (the lauric acid it contains is only found in coconut oil and human breast milk) as well as because it is one of the most heat-stable oild around. The one I use is a Virgin (ie cold-pressed) coconut oil from the Philippines, sold underthe Country Farm Organics label. I like to use ot in Asian cooking because it adds a nice, subtle coconut flavour, which I find to go well with almost all Asian recipes. If you do not have access to coconut oil or (for some unimaginable reason) don't like the taste, feel free to use grapeseed or another oild suitable for cooking at high temperatures. I love this recipe because despite the many steps involved, they slot very well together so it can all be done in about 30 to 45 minutes. What you get is a meal full of exotic flavours that will have you long for more! First, clean the pork, removing any fat and remaining tendons. For the marinade, combine the 5 crushed cloves of garlic, the ginger, yellow bean paste, honey, soy sauce, rice wine, brown sugar and 3 tbsp coconut oil in a tupperware container large enough to hold both pork fillets. Immerse the pork in the marinade and leave to stand and allow to infuse for at least 30 minutes (you could do this the night before as well!). Take a large cast-iron or stainless steel pan. Sear the pork (the marinade need to be kept aside for later) on all sides until nicely browning - I don't usually add any oil at that stage as the marinade contains quite a bit already. Transfer the meat to a casserole or other oven-proof dish and place in the pre-heated oven. Set the timer to 15 minutes. When the pork fillet is ready to come out of the oven, transfer onto a chopping board and leave to rest for 10 minutes. Retain the juices that will have gathered in the casserole. Heat the coconut oil in a wok, when the oil starts to smoke, add the garlic and chilli and quickly fry off, stirring constantly to prevent charring. Add the pak choi and stir-fry for 2-3 minutes, adding some water or rice vinegar to create some steam. Now reheat the pan you used to sear off the pork, add the remaining juices from the casserole as well as the left-over marinade. Gently warm through. Cut the pork into 2-3 cm medallions, then toss in the hot sauce. Arrange the pak choi on a big serving plate with the pork fillet arranged on top, spoon over some more sauce. Serve with the steamed rice on the side. * adapted from "Ching's Chines Food in Minutes"
While I should be used to winter weather, being Austrian and all, I had a hard time convincing myself that it was a good idea to leave the house today. I can get quite excited about snow, especially waking up to a winter wonderland where life as we know it has ground to a halt and everything is incredibly still, quiet, subdued - but what we had today was an entirely different story. It was like the heavens couldn't decide whether to snow or rain and the few flakes we got were just wet and slushy and very short-lived indeed. And while the air is usually quite dry when it snows, today you had moisture creeping everywhere, into the deepest, darkest crevices of your body... so you can probably see why I didn't jump for joy! There was no way I was leaving the house again after the school run and with a weekend just behind us, there wasn't an awful lot of food in the fridge... left-overs pasta would have to do. A rich, creamy sauce with walnuts and spinach was my best bet - I used a single malt whisky from Wales (don't tell my husband) which added a wonderfully smoky note, if my husband didn't have such expensive tastes when it comes to single malts, I would use them more often in cooking! Be creative when you cook this, use your intuition as to how much of the cheese to use especially - gorgonzola varies so much in taste and intensity, so adjust down or up depending on what yours is like. And you could probably skip toasting the walnuts, but it makes their flavour so much more mellow, takes the bitterness away a little and is therefore definitely worth the five minutes. Toast the walnuts in a dry pan until browning and fragrant. Chop and set aside. Melt the ghee (butter) in a pot, fry the garlic in it until just starting to colour. Deglaze with the whisky, leave to bubble for about 1 minute. Cut the gorgonzola into small cubes, add to the pot together with the cream and leave to cook over medium heat until you have a smooth sauce - constant stirring is required. Season with salt, white pepper and nutmeg. Meanwhile, cook the spaghetti in salt water to packet instructions. Drain. Stir the sauce into the spaghetti, fold in the spinach and walnuts and serve immediately. Reading the title of this post, you might think I've gone a bit coocoo - lasagne? fish? egg??? - but this is not a lasagne in its true sense. It is a much lighter version, more subtle in taste, little hassle to assemble and the poached egg, well, that's a little extra treat for the more adventurous eaters among you. Feel free to leave the egg out if the idea of an open lasagne and especially one using fish is already pushing the boat out into uncomfortably deep culinary waters so to speak. This is the recipe for you if you want something unusual, creamy and scrumptious... you can prepare most ingredients ahead, then reheat at the time of assembly - the only thing that needs attention on the spot is the poached egg. I have made a vow to adapt this recipe even further by assembling and baking in the oven shortly before serving - but the opportunity hasn't presented itself yet! So there you have it, that's my resolution for 2010! I recently reconnected with an old friend I have not seen in almost twenty years (oh, the wonderful world of facebook) and as a busy working Mum, she asked for recipes that she can "prepare in about half an hour using just one pan". That's exactly the kind of cooking I am forced to do most of the time now, being a full-time student and mother of three... but being pressed for time also means that I can't stop to photograph, so there aren't many recipes I publish. I have trawled through the list of dishes made over the years and found quite a few that fit the bill in at least one of the two categories and I will label them accordingly very soon - look out for a drop-down box on the sidebar entitled "quick fixes" or something along those lines! This is a wonderfully rustic dish - this is only the second time I ever made skate and I don't know why I don't cook it more... it's one of those fish that are no hassle whatsoever to prepare, nor is it fiddly to eat. You simply roast it in the oven, then literally scrape the meat off the rather peculiar-looking, long and thick bones - no choking on little bones, you're left with just a pile of juicy meat that goes brilliantly with the farm-house style lentils and beans. Have I ever experienced love at first sight? That lightning-bolt experience that's the key ingredient to so many movies? Yes, I have, but it certainly wasn't with chickpeas.We've had several encounters, in many incarnations - and whenever it DID turn into a romance, it was a whirlwind, no holding back-type thing. Chickpeas don't feature in the latitudes I grew up in, at least not in the 70s, 80s. I guess the very first time I came across them must have been in France, playing a supporting role in a vegetarian tagine. Although I liked the dish, I wouldn't have awarded them legumes an oscar. It was when I moved to London that I once again broadened my culinary horizons and discovered Middle Eastern and North African food. Hummus was my first love - especially a certain tub they used to do at M&S with spicy red peppers... head over heels! Nowadays, I am addicted to Sainsbury's Morroccan hummus... again, a spicy version with whole chickpeas and red peppers - absolutely divine. I have yet to experience the same feelings for a tub of home-made, if you have any great recipes, do send them my way - I am always happy to learn new tricks. Last week, fellow blogger Kalyn of Kalyn's Kitchen posted a recipe for chickpea soup - I read it on a rainy day, sitting in my unheated house with my toes turning blue from the creeping cold... and I just couldn't resist making this soup. As usual, I have completely bastardised it - I used canned chickpeas (so much quicker), I went wild on the spices (cumin, turmeric, sumac all in tbsp amounts) and I decided to make it in my Thermomix, as I feel slightly guilty for not posting enough recipes with TX instructions. - use good quality sumac: the first time I came across it was at a workshop with Herbie's Spices from Australia... while I love their products for the exotic tastes they made me discover (wattle seed, bush tomato, lemon myrtle), I have since found that purchased from Arabic shops, the sumac is much more intense, pungent and refreshingly lemony than anything I have had before. The one I currently use (extensively) is from Mymouné which I picked up at Comptoir Libanais. Believe me, it's out of this world. - don't overcook your chickpeas: they really taste so much better when the soup has a somewhat "coarse" consistency - a bit of bite, really. - don't skimp on the extra-virgin olive oil: again, use the best quality you can find, its grassy notes add an extra complexity you wouldn't want to miss! - accept the spices with open arms: not only do they taste great, they have health benefits noone can do without. Sumac is a free-radical scavenger and widely used for urinary complaints, cumin strengthens your respiratory and digestive system and turmeric is the number one herbal remedy to keep your cholesterol levels in check. A tasty, warming soup that is also good for you... and if that wasn't enough, it's also ready in a good 20 minutes - what more could you possibly ask for??? Although this recipe is, in fact, borrowed at least in principle (see above), it'll be my contribution to this month's My Legume Love Affair, and before you ask, this has been authorised by the generous Jeanne of Cook Sister! who hosts this edition. If you want to participate, you can do so until the end of the month, details here. Friends are a wonderful thing... especially when they come bearing gifts. My friend Anna is special in very many ways, apart from being a wonderfully caring, supportive and active mother-of-two, she has also founded an amazing support group for parents who want to make sure their kids grow up in the healthiest way possible. This group has become a veritable treasure chest for information and although people mostly know each other only virtually, it has quickly become the one-stop shop in all things children - your child is ill and you look for natural ways of supporting them, you ask your Arnica friends. A doctor is recommending a certain treatment and you want a second opinion, you consult with one of the many doctors, nurses and complementary therapists that are part of the network. You're stuck for ideas of how to keep a 2-year-old occupied on a 20-hour flight, Arnica has the answer. My first thought was what a wonderful weapon it would make... don't laugh, I bet you have been in a situation where you could positively have killed a given member of your household - and don't you try and make me believe otherwise! Luckily, my husband (despite the fact that he's on leave this week and the opportunities presenting themselves should be plentifold) has been on his absolute best behaviour, so I've decided to use the ginormous zucchino for cooking instead. I chopped some into our weekly Asian soup fix, I made a wonderful cream of courgettes for lunch and last night, I made these lovely little numbers here: a slice of courgette, some thick and onctuous tomato sauce with just the tinest kick of spice, a generous layer of scamorza (smoked mozzarella) and a crispy topping of quinoa laced with garlic oil and rosemary... the best dish yet. A little later than anticipated, I finally got round to organising my tapas extravaganza, all in honour of Andrew's WTSIM event this month. And if you haven't had the time to send in your entry yet, you should know that he has gracefully extended the deadline - no excuses now! I am not sure why, but up until now, I had this immense fear of tortilla failure... and I don't even think it was due to scaremongering, it's more the fact that all the Spaniards I know (and even those who aren't Spanish, but are in love with Spanish food) seem to be extremely opinionated or simply picky when it comes to a tortilla española or Spanish omelett. Whenever I have eaten tortilla in the presence of Spanish friends, I have never heard a word of praise for it, it was always "too dry", "overcooked", "bland", "rubbery" or "just not how they make it here or there". So to get a tortilla right, I was assuming, you needed immense skill and hundreds of years of experience. After last week's first attempts, I can safely say that this is not the case, a natural talent or beginner's luck, maybe (patting herself on shoulder), but I believe to have found out that the quintessential factor is that it must be boiling hot outside so you can stand there over the hot stove, sweat running down your forehead, spine and just about everywhere imaginable and then you can make a pretty darn tasty tortilla just like a Spanish mama would. When I called my friend Sonia to ask for rough guidance on how to make one (I had seen her do it a million times and never actually jotted down any notes), I was brave enough to pass an idea past her. I: "So, what if I wanted to give the tortilla a little twist, you know, more than just potato and egg?" She: "Well, some people put onion in." Me (actually saying out loud): "I was thinking more along the lines of feta, chilli and parsley". In her defense, I have never heard her swear, this last bit is completely made up, but it might well have been racing through her mind. Understandably so. Undeterred, I decided to go for the "adventurous, but still authentic" version that involved some chopped onions and then I did the unimaginable. I made a second lot, defiling the graves of my dear friend's ancestors by putting in some diced feta, chopped chilli and parsley... and you know what, my guests (admittedly completely ignorant when it comes to Spanish food) preferred that second version. But I didn't leave it at that, I had to get Sonia's opinion as well - she praised my traditional tortilla, saying it was tasty and moist and everything you'd expect, she wasn't raving about the eccentric version, which is just as well... but her kids ate it without complaints and they're pretty fussy and strongheaded usually, so I take this as a point in my favour. I also made some gambas al ajillo, always a winner in my book with loads of garlic and chilli - although I love my prawns, it is the juices I make this for - brilliant for mopping up with some home-made sourdough! Inspired by Sonia's home region of the Basque country and their own twist on tapas (which the call pintxos... don't you love that name?) I made some pintxos of sauteed garlic & herb mushrooms with prawns. And again, although the prawns add a lovely colour and give it that little extra in the looks department, I am just as happy just with the mushrooms fried in a pan, drizzled with garlic and oil, then deglazed with sherry vinegar. All in all, I made a vow to make tapas more often and especially the tortilla, which is not that hard to make at all - and seeing that it's one of my daughter's favourite foods, I better indulge her with it more often. Do try them all and see what you think: if you have no ties to Spain other than the odd vacation, try the "adventurous" version - I find it light, refreshing and super yummy. I also served this as part of a picnic spread at the Royal Henley Regatta and it went down a treat. It would be a shame to discard such a winning recipe just on the grounds of it not being entirely original, I hope you'll agree! The deadline for WTSIM has just been extended, as Jeanne, Andrew and myself were roasting in the sun at the Royal Henley Regatta on Saturday, we figured it's been hot enough out there to give you and ourselves a break... check details on SpittoonExtra - no excuses now not to indulge in a tapas evening! Gone are the days when all I had to think about was what to stuff my face with... and more often than not, as a student and/or single this either means how to secure the next treat or how to cheat your way to a four-course meal for the £2.50 that's left of your monthly allowance after a boozy night out with your friends. Then you grow up, have a family and all of a sudden you become concerned about what they stuff their faces with... for me this began when I was pregnant with my daughter and gave up vegetarianism to be sure the growing baby would get all the nutrients she needed - eating well in pregnancy is difficult enough, overcomplicating it by sticking to a vegetarian diet didn't seem like a good idea. When they grow up, you realise just how much of a role model you are. Since they learn mostly by observation, it's no good trying to drill them to "eat yer greens" if you yourself shudder at the sight of a tenderstem broccoli or sprint faster than a runner bean at the sight of a vegetable curry. You have to lead by example. Which is not too hard for me, given that I like all vegetables, some more some less, but there's only one I loathe with a passion: beetroot. Where was I? Oh yes, the importance of eating your greens. You might have taken that on board already, when you realise that even the latest wisdom in nutritional science has a sell-by date - what used to be considered healthy in my teens is no longer so... my Mum, for example, used to insist that we should eat rye bread always, yet years later it emerged that it contains just as few nutrients as white. I felt like I had been cheated out of years of eating crunchy baguettes and buttery croissants... and my poor mother sought solace in the tasteless wholewheat cakes and no-fat spelt muffins that were so popular in the Eighties - and with popular I mean that everybody made them, but nobody actually ate them. Another such wisdom that will haunt me forever is one that my gran almost beat into me: babies need to eat spinach at least once a day! That tender leaf might have been nutritionally valuable when my father grew up after the war, but it then emerged that spinach attracts heavy metal like nothing else... it can actually be quite toxic - so another theory went out of the window. And don't get me started on the whole cholesterol issue and that unbearable margarine!!!! The current nutritional buzzwords in my part of the world are melatonin and fatty acids. Young mothers should be particularly familiar with the former, as it is the reason for babies having crying sessions in the evenings, which can be quite debilitating for the poor parents, but it serves a purpose. It encourages the shedding of melatonin in the mother, a hormone that plays an important role in the sleep cycle and makes babies (and adults alike) sleepy. So the baby might cry at first, but after being fed, it'll sleep better. And this is the reason why we now can buy milk in the UK that has been fortified with melatonin. It seems to me that these days, you don't even need to be concerned about what you're feeding your kids anymore because manufacturers add nutrients to everything: added calcium and vitamin D in your yoghurt, vitamins in your cereal, melatonin in your milk, folic acid in bread and possibly now tap water (! ), omega3 in your smoothie... if people ate regular diets, instead of gobbling down burgers, sandwiches, chips and soft drinks all the time, they wouldn't need all that! But it looks like we're on the best way to eating astronaut food in a few decades! So here's how to add some oleic acid to your diet, said to help prevent breast cancer. Apparently it also helps with concentration (and as everything these days is said to help you to a higher IQ - looks like parents don't listen until you tell us that our children are going to be as dumb as a stump unless they eat it! ), enough reason for me to bring it into my kids' diets more. 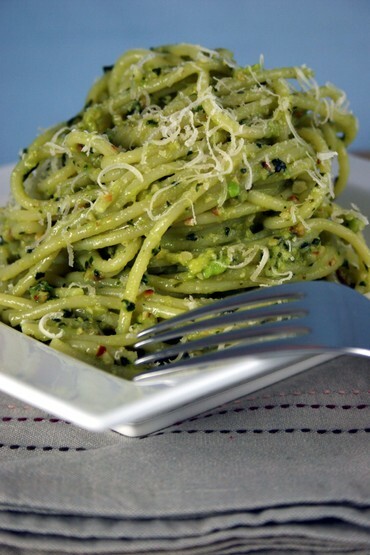 These spaghetti are a sure hit, as apart from the health benefits, they're also incredibly easy to make - if you want, you can even use store-bought pesto rather than making your own, but I guess it's worth going the extra mile given that it doesn't take more than ten minutes! So even if I should find out a few years down the line that those poly-unsaturated fatty acids (PUFAs for short) raising your IQ is all a big hoax and our bread producers start adding the next best thing to their food, I'll still be making this quick and healthy pasta sauce - after all, it's all about the taste with me, you know? And this one sure is a keeper! When our charming host Andrew of SpittoonExtra announced this month's theme for "Waiter, there's something in my..." I was a bit hopeless. Pineapple doesn't feature much in my cooking, if anything, I'd enjoy it raw in a fruit salad or the way I learnt to eat fruit in Mexico: sliced, with a drizzle of lime and a generous sprinkling of chile piquín or cayenne pepper. The first thing that came to my mind was a pineapple upsidedown cake or tarte tatin, but then I figured there would be about a dozen entries with that theme. Then something came to me in my dreams. Literally. I somehow time-travelled back to a trip to Paris, eternal city of love and food, and a visit to a phantastic restaurant that sadly is no more - La Table de Lucullus in the 17th district. It was a tiny place, a mere six or eight tables, and no menu to speak of - Nicolas, chef-owner of the place, would come round to every table personally and recite what was on offer that day. And as luck would have it, that night it was pork belly. Pork belly is not something I cook at home (until yesterday), simply because it never featured in my Mum's cooking, so I didn't have the first clue how to make it. I have had it a number of times in various restaurants - but there are only two that stick in my mind: the version done at Salt Yard (to this date, I believe), a garlicky affair with a crispy skin, the whole sitting on indulging white beans, and the version Nicolas made that night which was possibly the best way of eating a pork belly ever. I was hesitant to order it that night in Paris, but Nicolas insisted in his charming French accent that is was "verrrry tasty". And tasty it was. From that night on, whenever I think of pork belly, it is his version I remember, even some six years on. My husband had been bugging me to try and recreate this dish forever - and here was my chance. Andrew was sort of handing me a ticket to fulfill Chris' dream, and so I jumped at the occasion. It was more difficult that I thought to get some decent pork belly - I went to the Borough Market specifically for it, as it's the place where I always turn when I need something special, something that I am unfamiliar with and therefore unable to judge its quality. But what was on offer there did not meet my expectations at all - they were all sad-looking pieces of pork belly that consisted of nothing but fat... yes, I know, the fat is important in a pork belly, but you do want some meat to go with that as well. I'd settle for half-and-half, but don't want to be paying for 5 kg of belly to get ten meagre bites of pork. So I trod back home, disappointed at my failure to find a decent piece, and was wrecking my brain as to what else I could come up with for WTSIM that included pineapple. I was almost tempted to bail out or make a piña colada instead... but decided to gave my local butcher a try on the way back from the station (they're actually very good, people come from near and far to buy there and on the weekend, there's always a queue). And guess what? I got a brilliant piece of pork belly that cost a fraction of what I would have paid at the Borough. I started that same night: brining the belly in a similar fashion as I had done before with pork fillet, using pineapple juice this time and stock and lots of spices: cinnamon, cloves, star anise, peppercorns, garlic. Pineapple contains enzymes that tenderise meat in a way that nothing else does, so I was sure this would be perfect. And it was. The next day I just had to stud the rack with garlic, season it a bit more and place in the oven on some slices of pineapple - slow-cooking for three or four hours and hoping for the best. It turned out phenominally good for a first try and it definitely won't be the last time I made pork belly... especially since I now know I can buy it just a few hundred meters down the road!